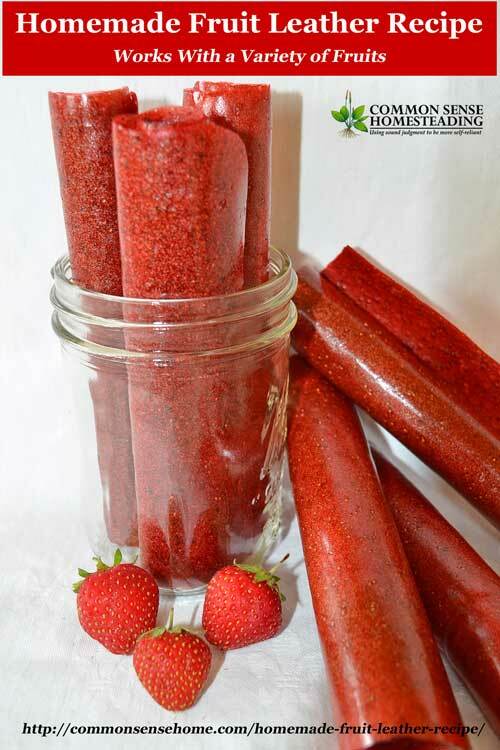 This homemade fruit leather recipe works well with a variety of fruits – fresh, canned or frozen – such as berries, pears or peaches. (Citrus does not work well.) Since you choose the fruit, you can avoid artificial colors and flavors so common in commercial fruit rolls. (Homemade is also more budget friendly than organic fruit leather.) You can also adjust the sweetener – or leave it out completely. I usually make up a batch in the evening and it's ready the next morning. This is also a great way to get kids involved in the kitchen. They can pick the flavors – and even pick the fruit right off the plant! For the younger crowd with limited food prep skills, the fruit prep doesn't have to be cosmetically perfect because everything ends up in the blender. Start with equal parts of applesauce and fruit of your choice; fresh, thawed frozen, or drained canned. Homemade applesauce tends to work a little better if you have it available. If desired, you can also sweeten the fruit puree with 1-3 tablespoon of fruit juice concentrate. Orange juice concentrate adds a little citrus brightness, but any fruit juice concentrate will do. Blend your applesauce, fruit puree and sweetener (if desired). The applesauce adds pectin, which creates the “leathery” texture of fruit leather. Without applesauce, most fruit puree will dry into a brittle sheet that crumbles when you peel if off the dehydrator sheets. Prepare your fruit leather sheets by oiling lightly with a neutral oil such as refined coconut oil so the leather will release easily. Spread the puree evenly over the sheet in a 1/4 inch thick layer. Load trays into dehydrator and dry at 135°F (57°C) for 8-20 hours. (Drying times will vary depending on which dehydrator you use, the amount of liquid in fruit, humidity levels in the air, and thickness of the fruit.) When dry, fruit leather should feel “leathery” – not sticky. I like to cut the leather into serving size portions before storage, and either stack them or roll them and pack into a zip top baggie or wide mouth mason jar for easy access. If properly dried, this homemade fruit leather should be shelf stable. You can store it in the refrigerator for a longer shelf life, but it's not required. Which Fruits are Best for Homemade Fruit Leather? Canned fruits will contain extra liquid (and often sugar), which will increase drying times. Frozen fruit may be partially drained after thawing, which will decrease drying times. While applesauce or additional pectin is needed to produce a fruit leather with low pectin fruits, you are likely to be able to produce a leather with fruits that are higher in pectin on their own. That said, the applesauce combination mellows out the flavors and produces more consistent results. It can also help stretch things like berries, which tend to be more expensive. A mix of berries and apples still tastes mostly like berries when dried. If you don't want to use applesauce, you can also purchase powdered apple pectin for thickening. Add 1-2 tablespoons per 3 cups puree. Feeling a little creative? Mix up two different purees, and spread them on your drying trays in stripes or put a lighter puree down as a base and use a darker puree for polka dots! It's pretty easy to whip up a batch of fruit leather, but a few kitchen tools are needed. Blender – Think applesauce consistency for your puree. I currently have a Vitamix, but any reasonably high powered blender or food processor will do. 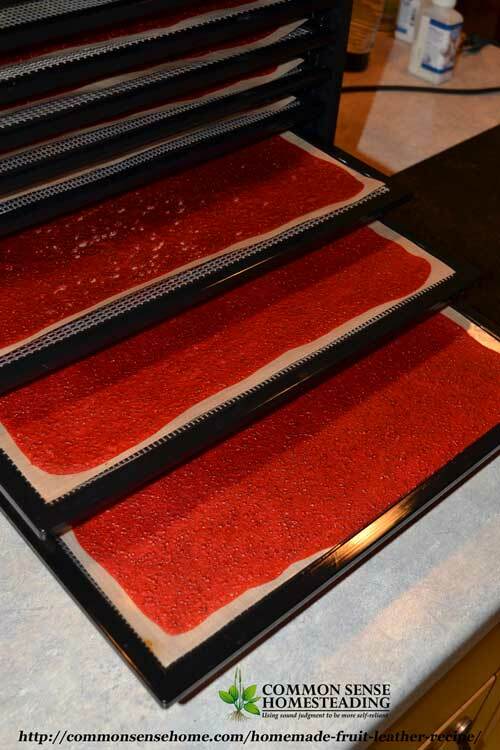 I like the Excalibur dehydrator for making fruit leathers because it is a little bit easier to spread the puree evenly on a rectangular surface. It's also easier to cut and roll strips from a rectangle rather than a doughnut shape. 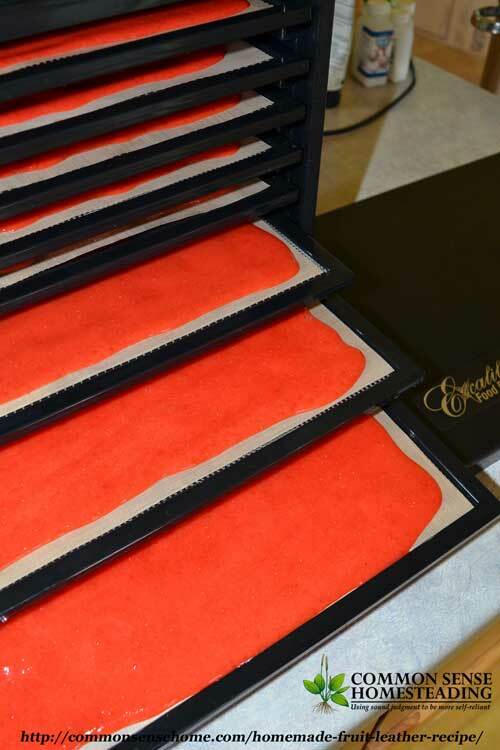 Fruit Leather Sheets – I bought the basic non-stick sheets for my Excalibur. Their ParaFlexx fruit leather sheets are much nicer, but more expensive. If you do a lot of leathers or foods with smaller pieces, they're probably worth the investment. Snackmasters come with two fruit roll sheets, but you can also purchase additional fruit roll sheets. 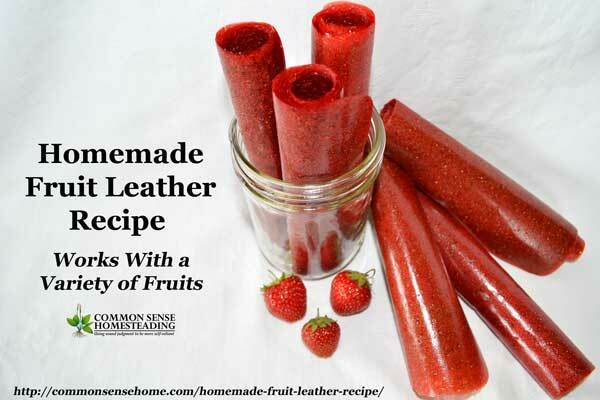 Have you made homemade fruit leather? If so, what's your favorite flavor combination? Leave a comment and let me know! Thank you for this! I really want to try it. My granddaughter is allergic to sorbitol found in apples and pears. Can I use apricot, peaches or other fruit high in pectin as the base. She obviously couldn’t have the apple based pectin sugar. You should be able to get an acceptable product, but it will likely take some experimenting to find the flavors and texture you like. Applesauce is typically used because it makes a neutral flavor base and smooth texture. I’d start with small batches and keep notes on what works and what doesn’t. Based on your recommendation, I purchased the Excalibur dehydrator which came by UPS yesterday. However, I forgot to order the sheets for making fruit leather. We don’t always get decent fruit from our trees in Northern Nevada (Reno area) due to late spring frosts. But this year? wow! My apricots are the size of large peaches. I’ve bottled all I could (wide mouth quart canning jars are nonexistent in this area, too. I wisely purchased 6 cases early on but now they’re all gone everywhere) so now I’m on to making fruit leather, which I haven’t done in ages. I keep reading in the instruction book that I can use “plastic wrap” or their ParaFlexx sheets, which I forgot to order! Are they talking about plain “saran wrap” type of plastic wrap or can I use wax paper? Also, being as apricots have high pectin, can I just clean them up and pit them, and puree them in the blender, skin and all and use that for the fruit leather? Do I need to/should add anything else? Thanks for your help!! I have tried both plastic wrap and wax paper, and it can be tough to remove the finished fruit leather from them. It’ll work in a pinch, but the sheets are so much easier to work with. I didn’t invest in the ParaFlexx sheets yet. Instead I opted for the reusable parchment basic non-stick sheets. They aren’t quite as nice as the ParaFlexx sheets, but they get the job done and are much less expensive. They are light, so they ship fast, too. Apricot can be used to make a leather on their own, but it may be a little acidic for some palates, depending on the fruit. If the flavor is too strong, cut with applesauce to taste. Thank you for the information; I ordered the reusable sheets from Amazon. I have no idea how much I’ll use this dehydrator but it’s sure going to come in handy with this year’s bumper crop of fruit. I’m going to cut applesauce in with the apricots; I’ll just need to figure out the ratio. Thanks again for all your help. I love reading your site and getting all the helpful information. You’re welcome. I find my dehydrator use goes in cycles. When it’s harvest season, I use it almost daily. In the middle of winter, less often. That’s mostly jerky and yogurt season – or even proofing bread if the house is chilly. I was wondering this very thing, since my Presto Dehydro doesn’t come with fruit leather sheets. Sounds like it’s worth the extra money though! Thanks! The sheets are great for other small items, too, like tiny herb leaves. Is it necessary to cook the Fruit? I cannot get the fruit leather to dry out in the middle and if i try it makes the edges beyond dry. Help! I was cooking the strawberries for 20 min with a little honey and then blending them. What am i doing wrong?!?! I don’t cook the strawberries. The applesauce is cooked. Using honey will increase drying time versus a similar amount of sugar, as it tends to hold water even more than sugar. You may want to consider spreading the fruit in strips, rather than filling the trays, or trying to make sure that you’re spreading it thicker by the edges and thinner in the center. Another option would be to peel the leather off the tray half way through when it is set up enough to handle but not completely dry. Flip it over and finish drying on a mesh screen instead of on the fruit roll trays. You can also cut or peel off outer edges that are dry, and leave thicker areas in the dehydrator to finish drying. After making, can the leather be canned? If so, would just a hot water bath be enough? If properly dried, the fruit leather should be shelf stable. Drying inhibits bacteria growth, as does the acidity of the fruit. I still have a little bit leftover from last year in the pantry in a mason jar, and it’s just fine. No fur, no off flavor. Canning doesn’t work well with dry foods, because it relies on conductive heat transfer from water or steam to the liquid contents in jars. The liquid allows the heat to evenly distribute throughout the jar. Which brand of dehydrator has their service (repair)centre at Asansol (westbengal). How much (in kg)vegetable do I dehydrate in a day in a Excalibur 5 tray dehydrator? Or any similar dehydrator available at Asansol. ?please reply through email as early as possible. I’m sorry, but my search engine results for West Bengal aren’t very good. There is an Excalibur dealer operating in India, so they should be available in West Bengal. The amount of food that can be dried at one time depending on what type of food you are drying and how it is prepared for drying. The trays measure 38 cm x 8 cm. I’m new to dehydrating and having pretty good luck… except pineapple. The one flavor my daughter requests and it never turns out. It always turns into a cracker. I’ve adjusted the heat, I’ve added a banana to thicken. I am thinking I should try reducing on the stove? After reading your blog I wonder if apple would help. The lady in Welicious does it rare with no problems. Im at a loss… any suggestions? All ingredients are blended raw and then spread on sheets and dried. This is an awesome page! I’ve just bought a commercial dehydrator. I’m looking to make these fruit leathers. I have a few questions. 1) If using all fresh fruit and apple sauce ( from a can that is good for 1 year). What expiry date should I write on the bags? 2) Will this work with veggies as well? I try to use dehydrated items within one year for best quality. I suppose you could use veggies, but I’d probably stick to sweeter ones like carrots or beets or a blend. I don’t think Swiss chard leather would make you very popular with most snackers, but I may be mistaken.